Connection - its main purpose is to connect two shapes but it could be also used separately. You can select it, resize it, rotate it, copy/paste it. Shape - this is the base element of the diagram, just like a node for a graph. 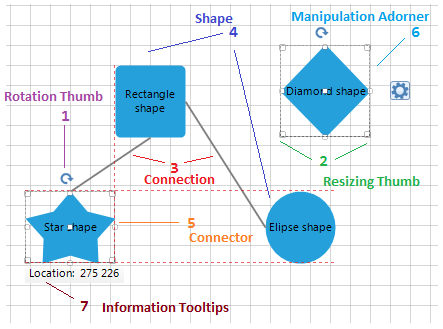 You can select it, drag it, resize it, rotate it, connect it to other shapes, set its content, copy/paste it. There are three types of predefined, geometrical shapes - Basic Shapes, Flow Shapes and Arrows. You can also define your own custom shape by deriving from RadDiagramShapeBase or RadDiagramShape class.